If you subscribe now you are preordering for July’s box, which is Doctor Who/Sherlock themed! 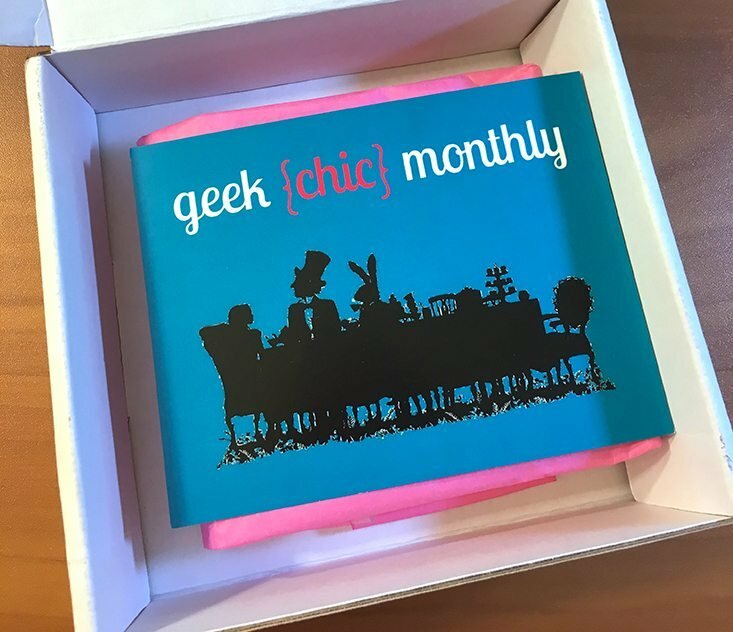 Check out the Geek + Nerd Subscription Box Directory and make sure to add Geek Chic Monthly to your subscription list or wishlist! April’s theme is Alice in Wonderland! The info card is pretty simple; it does not list the included items. It says that sneak peeks, theme reveals, and shipping updates can be found on social media. All the items came packaged inside this cute pouch. The front is a Cheshire Cat print and the other side is fuzzy blue fabric. 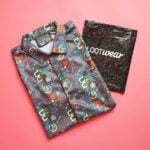 The inside is a fun polka dot print. It’s nearly the size of my hand. I’d say the quality is pretty good! I used to wear a teddy bear-shaped watch pendant around my neck as a child. Since then I’ve always loved the idea of watches that double as jewelry. The antique finish on this piece is awesome and the watch has very intricate designs on both sides. I think this perfectly fits the Alice in Wonderland aesthetic. Closeups of the pouch and pocket watch necklace. How handy! This plastic key is meant to wrap and organize earbud cords. I can’t stress enough how much I adore things that are cute AND functional. Again, this cool bracelet fits the Alice in Wonderland theme so well. Isn’t this tea party scene the original illustration from the book? The bracelet is adjustable and comfortable to wear! These are the cutest and most creative earrings ever! I really love the current earring trend that utilizes earring backs for cool designs (even though I don’t have pierced ears, ha). When you’re not wearing them the rabbits stand up by itself and look like decorations. You can see how they look on ears in one of the photos on their site. 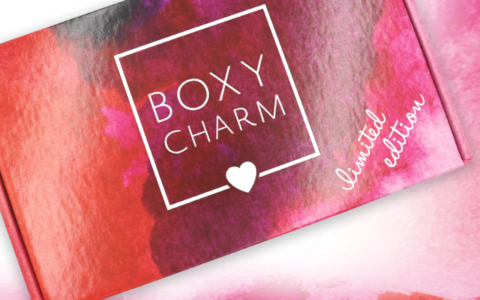 Verdict: I had a great time exploring my Geek Chic Monthly box! I thought every item was charming, but the earrings are definitely my favorite. The jewelry quality was great as well. I couldn’t estimate retail value but for under $4 apiece I think the value is definitely there. Maybe Geek Chic Monthly can list all the items on the info card for future months, but it’s a small concern that doesn’t take away from curation or box cohesiveness. Are there any sale codes on this subscription? I wish I could buy that box. I love everything in it!